Even true divas can get a little tripped up over the lyrics sometimes. 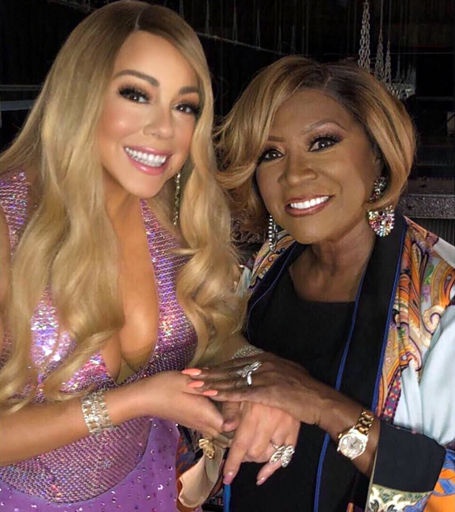 Soul legend Patti LaBelle came to see her goddaughter Mariah Carey's Caution world tour stop in Philadelphia earlier his week. After the show, the ladies sipped wine backstage and struck up an impromptu duet of Mimi's 2018 single "With You". "Shots of Remy, playing 'Confessions' and our bodies blendin'," the music icons sang in unison, then split into harmony. "Ooh, I'm in love it's true. Yeah, damn, I [censored] with you," Mariah continued - lyrics that her 74-year-old friend did not see coming. "Oh, you say F with you?" Patti gasped, eyes wide. As Mariah broke down the words, her godmother covered her mouth in surprise. "See, she didn't know I said that! Cut it out." the "A No No" singer joked to the camera. The slip-up didn't totally derail their musical moment, though. Mariah quickly got Patti back on track, moving straight into the next few lines. "And we all make mistakes sometimes, but we muddle through," they continued. "I don't know what I'm supposed to do, oh baby, I'm in love, it's true." "A fun moment with Ms Patti Labelle singing With You," Mariah captioned a video of their song. The vocalists documented their bonding sesh with a picture, which Mariah shared on Instagram the following day. "With the incredible, incomparable, one and only Ms. Patti LaBelle," she wrote. "Thank you Patti and all of you who came to see the Caution world tour in Philly last night." "I love you daughter and thank you for a fabulous time as usual," the "Come What May" singer commented back. "You are amazing and I love you always." Patti recently talked about her affectionate relationship with the younger songstress on "Busy Tonight", joking that sometimes she has to give her a little tough love. "I have to slap her every now and then," she quipped to host Busy Philipps. "But she's so phenomenal and so good, she doesn't need to be slapped anymore. That's my baby."